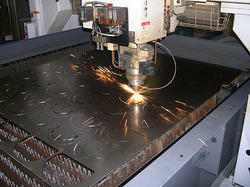 Prominent & Leading Manufacturer from Chennai, we offer steel laser cutting service. Our laser technology allows for accurate cutting of sheet metal. Commonly cut metals include stainless steel, mild steel, and aluminum. We have hired highly dedicated engineers who possess deep knowledge of the domain to carry out these services.